A typical system consists of an underground tank, a distribution line and a soil absorption drainage field. Wastewater leaves the home through an underground pipe connected to the septic tank. Baffles in the septic tank slow the flow of the incoming wastewater and prevent sewage from flowing directly through the tank. Heavier solids settle to the bottom and accumulate as sludge. The septic system is a natural sewage treatment and disposal system. By natural we mean that it relies on bacteria to digest and clean the wastewater. Septic systems are biological systems and must have bacteria to work. The bacteria in the septic tank eat & digest the solids in the tank turning them into liquids and gases. Raw household wastewater will quickly clog all but the most porous gravel formations. A septic tank is a sealed chamber, which conditions the wastewater to reduce clogging so that it may be more readily absorbed into the soil. The septic tank separates the settable and floatable solids, promotes the growth of anaerobic bacteria necessary to decompose the solids, and provides storage for the resulting sludge and scum. Septic tanks should be located where they will not cause contamination of any well, spring or any other source of water supply. The septic tank should not be located closer than 10 feet from any building. The tank should not be found in swampy areas, nor in areas subject to flooding. Slopes greater than 25 percent will cause considerable difficulty in construction, and may slide once they become saturated with effluent. There must be no permanent cover placed over the septic tank or lateral lines. First things first: KNOW WHERE YOUR TANK IS! Keep your drains clean. If it is not biodegradable, it does not belong in your system. No sanitary napkins, disposable diapers, cigarettes, cat litter, condoms, any packaging or cotton swabs. Operation and maintenance of a septic tank are important. A system that is neglected or misused will have a shortened life expectancy. Limit the usage of garbage disposals. This can double the amount of solids in your system. Fortunately, it’s easy to use water wisely throughout the house. Whether washing vegetables, cleaning dishes, brushing your teeth or shaving, use the plug and water in the sink to avoid leaving the taps running. The biggest maintenance task is pumping the solids from the tank. After a few years, the solids that accumulate in the tank need to be removed and disposed of properly. If not removed, the solids will spill over into the drain field and clog the soil. With proper maintenance, a septic system can work efficiently for many years. Think of pumping your septic as you would to tuning up tour car. It is always wiser to do it before it stops working. Many people often have chosen to use additives to eliminate the need to pump the tank although no additive has been proven effective. Some of the solids in the tank are sand, grit, plastic and other similar matter. No enzyme or bacteria can digest these. Other organic solids are not very digestible. Hence, they accumulate. Bacteria that are added must compete with bacteria that are adapted to living in your septic tank. These adapted bacteria have the home field advantage. The newly added organisms can’t compete. Enzymes are not living and cannot reproduce. Whatever is added to the tank is all that will ever be there; therefore the quantity of enzymes added are too low to be helpful. Warning signs range from subtle to insufferable. The grass over the system may become unusually green or spongy to walk on. Toilets, showers and sinks might take longer to drain. Occasional sewage odors may become noticeable, often after a rainfall. Sometimes homeowners discover gray or black liquids surfacing in the yard or backing up from fixtures in the home. Whatever the problem may be, fix it fast! Report any problems to your Township, before proceeding with repairs. Once the building department approval has been obtained, call a licensed contractor. Detail the full extent of the problem, giving specific details as to when you first noticed any symptoms. Repairs can range from clearing a few lines to replacing entire drain fields and landfilling contaminated soil. Costs vary from a few hundred dollars to thousands. The extent and cost of required repairs depend on how far you let the problem go. Summer and early fall are the best times to pump out your septic system. This leaves time before winter, for the tank to refill and for bacterial action to become re-established. Also, the ground won’t be frozen, and the spring water table, which can create buoyancy problems for septic tanks, has receded. Particular care should be taken when pumping tanks made of lightweight materials such as polyethylene, fiberglass and steel. Never enter a septic tank. Toxic gases in the tank can cause death or injury. Never smoke or use an open flame near septic tank openings. Combustible gases such as methane may be present. Treat all contact with septic system components as if they were a biological hazard. Wash thoroughly with a water-bleach mixture after each contact. All septic systems in Ontario are regulated by the Ontario Building Code. The OBC requires that a permit is obtained for the construction, installation, extension, enlargement, or alteration of any on-site sewage disposal system, or any building additions may also require modifications to your site sewage disposal system. As of April 6, 1998, the rules for smaller on-site septic systems are covered by the OBC (Ontario Building Code). While these rules are put in place by the province of Ontario, local agencies such as municipal building departments, boards of health or conservation authorities are responsible for issuing permits and doing inspections. The OBC includes regulations related to the operation and maintenance of septic systems requirements for servicing by qualified people, wastewater monitoring and sampling, septic tank pumps out, etc. If you have questions about the OBC requirements for new or existing septic systems, you should contact the septics enforcement in your area. Sites where a conventional system is impractical require an alternative system. The initial cost of an alternative system may be higher, but they save you money in the long run. Some on site systems are designed only to store wastewater, which is then pumped from the tank and trucked off site for treatment. Often used where septic systems cannot be accommodated, these holding tank systems depend on an alarm to warn when nearly full, and usually require an on-going contract with a pumping service. Several mechanical alternatives to septic systems are available on the market. These are active systems, using compressors or motors to introduce air into the treatment of wastewater. Most of these systems bubble air through wastewater, or use rotating discs to expose the sewage to air. 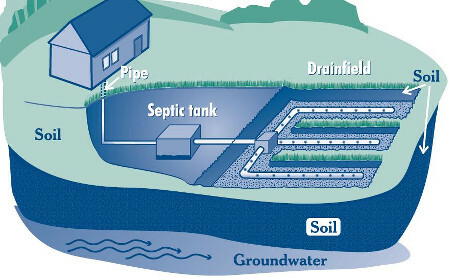 By contrast, a septic system, unless it uses a pump to discharge to the leaching bed, has no moving parts and requires no electricity. Aerobic systems can provide a higher level of treatment than standard septic tanks. They also require lubrication, electrical connections and more frequent maintenance than conventional septics. Some local health departments have been hesitant to approve these designs, because of problems that have arisen from improperly maintained systems; the same size drainage field may be required for an aerating system as for a standard septic system. These systems are improving as new technologies are further developed and demonstrated. Research into improved mechanical systems, better biological treatment media and systems using wetland or aquatic plants appears very promising. Where clay content of the soil is very high, and the property is relatively large, a lagoon may be the best solution. A properly designed and maintained lagoon works by evaporating the liquid waste. A well-maintained lagoon is relatively free of odor. Where the clay content of the soil is high, or the groundwater is close to the surface, a mound system may be the answer. These systems work by placing the absorption laterals upon the ground surface and covering them with high permeable soil. Thus, most of the wastewater effluent is lost in evaporation and evapotranspiration. Where a very little area is available for the placement of laterals, or the bedrock is at or near the surface, a sand filter is a good choice. Sand filters work by forcing a measured dose of effluent through a bed of special sand, collecting the clear, odorless effluent, and then discharging it into a reduced size lateral or bed system. Many manufacturers provide prefabricated kits that may be installed by a very mechanically oriented homeowner. Sand filters can be expensive and require professional maintenance. Drinking water from a well on your property is the solution many rural residents have decided upon. Other solutions such as bottled water, rural water districts, and hauling water may not be available or are cost-prohibitive. The rural water well is the most common solution. Rural water wells are unlike city water systems in that the town system provides water that is regularly tested for many contaminants on a regular schedule. I didn’t know how septic tanks worked, but I always wondered. I’m moving to a home with a septic tank soon, and I’m happy to learn more about it ahead of time. I like that it’s a natural way of dealing with waste. Thanks for the info! Thanks for sharing. A simple issue can quickly turn into a messy complication, having professional care is highly recommended. Hi, very informative and usefull septic system guide, ill aply the tips, thank you very much for sharing. It’s crazy that septic tanks actually use natural treatments to take care of the waste. We were looking at a house that has a septic tank, but weren’t sure how it could benefit us. It would be nice to have something that will take care of the waste, and only need care every 2-3 years. I didn’t know how septic systems worked so I’m glad I came across this article. My wife and I are going to be building a house soon so I’m glad I know a little bit of what to expect when we have our home sewage system installed. It’ll also help my wife and I understand how to maintain our system so it doesn’t have future problems. In your article, you stated that a tap leaking just one drop per second wastes about 10,000 litres of water per year and a silent leaking toilet can waste up to 20 times that amount. When I went over to my mom’s house for dinner last night I had to turn off one of her faucets because she left it on. I wonder if there are certain septic systems that are more efficient. You wrote that you want to have your septic system installed away from wells, springs or any other source of water supply. My father is thinking about getting a septic tank installed on his property, and he asked me to research it. To keep everyone and the local environment safe, it would definitely be in his best interest to have the septic tank installed in an isolated area. You said that we shouldn’t ever enter the tank. If I was having trouble with my septic tank I would want to make sure I hired a professional to help me take care of it. It could be helpful to find a professional that is able to provide the services that you need. It’s good to know that garbage disposals can add a lot of extra waste to your septic system. Personally, I think it’s a good idea to set some kind of constant maintenance schedule up to prevent something like your garbage disposal or waste from building up sludge too quickly in your septic system. That way, you will not only be safe from leaks in your yard, but you will likely save money since your system won’t break down or overflow nearly as much. It really helped when you talked about how a septic system should be installed within 10 feet of any building. My parents are building a house and want to make sure they have an effective septic tank and a good pump to work with the house. Do you know how long it takes for a pro[per installation to compete for a tank servicing 6 people? My father’s septic system is a bit backed up and I was wondering who he should hire to fix that. In the article you wrote that a city will have septic codes and you should make sure you find a service that meets those. If they are meeting those, my father won’t have anything to worry about in regards to quality as they are holding themselves to a standard.